I've spent many years extolling the virtues of life on a cold brown dwarf moon. Similar to the Galilean moons of Jupiter, a moon orbiting a sub-brown dwarf would be warmed internally by the tidal forces generated by its proximity to such a powerful gravitational force. Additionally, the sub-brown dwarf itself might provide some local heating, or at least an abundance of charged-particle strewn local magnetic fields to energise the sub-stellar environment. So, a habitable environment on a moon seems a likely scenario. If a cold, dark sub-brown dwarf were to be found orbiting the Sun at a great distance, then it neatly provides the grounding for extraterrestrial life on our doorstep (1). This seems to me to be the simplest scenario for life in a sub-brown dwarf system. There are complexities - tidally-locked moons (2), lack of light, and so on. But the basics are there. 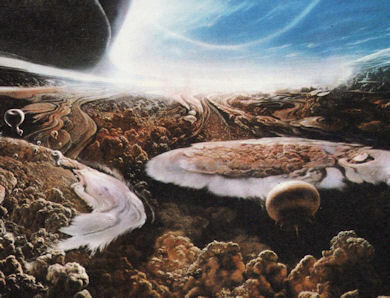 These ideas build upon work done by the late, great Carl Sagan (with his Cornell colleague E. E. Salpeter) on the potential for life in the clouds of the gas giant Jupiter, first considered back in the 1970s (5). 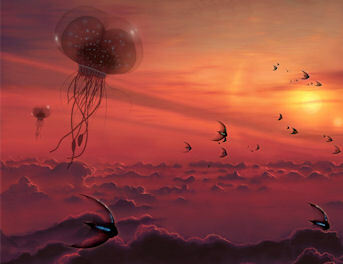 They envisioned giant 'floaters' filled with hydrogen bobbing through the Jovian atmosphere, tiny 'sinkers' and self-propelled 'hunters' which had evolved from the lazy floaters (6). All very speculative, but presented in Dr Sagan's inimitably compelling fashion. As another aside, Sagan's SETI colleague Jill Tartar was the astronomer who first coined the term 'brown dwarf' back in 1975 (10). The colour nomenclature chosen for these objects was an educated guess at the time. Brown dwarfs are red, cooling in tone to magentas and purples as they move into the smaller, older and colder categories of sub-stellar objects. Dr Marley may be right, of course. This is all very speculative. Certainly, the Scottish team have downgraded expectations considerably from the ideas 'floated about' in the halcyon days of 'Cosmos'. From Sagan's original grand vision of enormous floating organic bags of gas back then, to mere microbial forms these days. This reflects a more conservative view of what we might expect to find 'out there' prevalent in science now. Less little green men (or organic helium balloons in this case), more extremeophiles eking out living in the nooks and crannies of barren alien worlds. It's sad, really. For me, though, this is all rather academic. Because the real prize is what's going on in the planetary systems of these cold brown dwarfs. In my opinion, quite a bit! Picking up on the mystery of how a massive Planet X could form beyond the outer confines of the Sun's magnetic environment, as per my previous posts on the accretion of dust beyond the heliopause (1,2) and an exploratory scientific paper I published earlier in the year (3). I'm searching for evidence, or at least some educated guesswork, about whether interstellar medium beyond the heliosphere of stars might be sufficient over time to build up substantial, gaseous planets loosely bound to their parent star systems. Such planets might, I suggest, accumulate dust clouds and rings around them, undisrupted by the action of the solar wind trapped within the inner magnetic sphere of the solar system. Even though this kind of accumulation could be gradually taking place over billions of years, creating a meaningful adjustment to the mass of a substantial planet over these kinds of time periods, it doesn't seem likely that this kind of effect could take place if our current interstellar environment is anything to go by (although the unexpected presence of interstellar 'fluff' beyond the heliopause, described by NASA (4), and the intrusion of large grain particles into the outer solar system (5) do offer some evidence of what could be 'out there'). 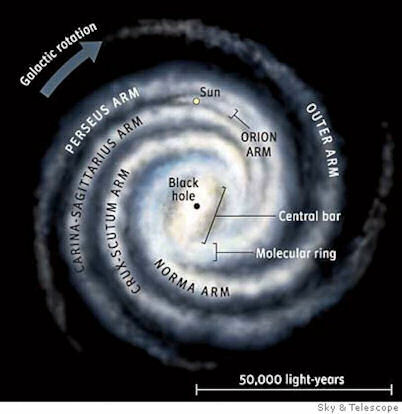 The (disputed) idea that the Sun's movement through spiral arms might be coincident with the onset of ice epochs has been explored by a number of scientific researchers (9, 10), and is known as the galaxy-ice age hypothesis. Various mechanisms have been offered to explain the cooling of the Earth, from cosmic radiation upon the Earth's atmosphere ionising gas into cloud-forming plasma (11), to the soaking up of the Earth's atmospheric oxygen by the interstellar clouds, bringing down its ozone layer dramatically (12). Another idea along similar lines was that the Earth's immediate space environment could be altered by the intrusion of dense interstellar matter into the solar system, pushing back the heliopause to a point actually within the Earth's orbit, thus rendering Earth and most of the other planets into a particularly cloudy interstellar space for a while (13). So, while this is all very interesting, what I'm focussed upon here is the nature of these passages through dense fields of interstellar dust. Recent work on the iridium layer associated with the extinction event 66 mya that killed off the dinosaurs has indicated that the Earth was exposed to this cosmic material over a period perhaps as long as 8 Myr. The implication of this may be that the iridium may have been deposited during prolonged exposure to a gigantic molecular cloud (14). The encounter with this vast dark cloud would have led over time to climate change and mass extinctions. The Ice Epochs are long-lived affairs, implying that the Sun's immersion in these dusty environments is prolonged (the very scale of the spiral arms themselves implies similar). Thus ample opportunity exists for the accretion of spiral arm interstellar dust around massive solar system planets beyond the heliosphere. Bear in mind that the dust clouds themselves are massive enough to push the heliopause back, potentially exposing the outer solar system gas and ice giant planets to this material, too. Once the clouds have passed, as the Sun moves on through, the heliopause is restored to its rightful place, and the action of the solar wind can once again clear out the Sun's inner sphere of influence. The dust and materials around the outer planets (Neptune, Uranus, Saturn, even perhaps Jupiter) previously gathered from the dust clouds during their incursion is thus largely removed. But this same mechanism does not apply beyond the current heliopause. 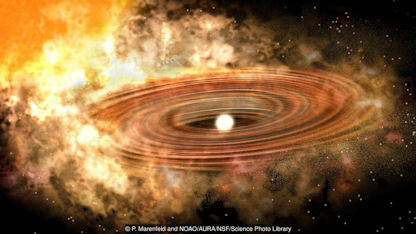 A massive Planet X could accumulate a great deal of dusty material around it, forming a nebula environment. There is no solar wind at that distance to clear it all up after the Sun has moved to clearer realms. A massive Planet X body could then slowly accrete the material into complex rotating rings, moons, asteroids, whatever. The elephant in the room here is that we are currently at the back end of a 4 Myr Ice Epoch. If there is a correlation between these Epochs - as opposed to the fluctuating Ice Ages and inter-glacial periods within them (driven largely by the Milankovitch Cycles) - and the immersion of the solar system in immense dust clouds (whether present in the borderlands of spiral arms or not) then it should be true to say that a massive Planet X object has recently been exposed to just such an effect. One might expect, then, that this massive Planet X body would still have wrapped around it this accumulated nebula. This would effectively cloak Planet X from our sight, both visibly and in the infra-red spectrum. No wonder, then, that this object is so difficult to observe, even when its gravitational presence is increasingly evident indirectly (15). 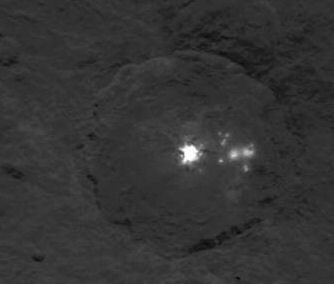 "Dawn’s cameras revealed that the floors of several craters on Ceres are coated with flowing material akin to lava on Earth. But the material looks less viscous than similar formations elsewhere in the solar system, [Ralf] Jaumann [of the German Aerospace Center] says, and it is tinged slightly blue – the same color as a mountain on Ceres thought to have formed by eruptions of ice mixed with mud. Jaumann and his colleagues theorize that the flowing material is a mixture of ice, mud and salts that erupted out of weak points in Ceres’ surface when large space rocks or other objects bombarded the dwarf planet. He and his team will publish their results in an upcoming issue of Geophysical Research Letters. New findings, presented at the American Geophysical Union meeting in San Francisco this month, show that ice can happily exist in permanently shadowed craters on Ceres and is widespread below the surface (5). in fact, Ceres is something of an 'ice palace'. This has raised the question of whether Ceres might have an abundance of active 'cryovolcanoes' lurking in the darkness of some of its craters, despite the extremely cold temperatures of its general environment (4). Furthermore, there appears to be spectrum of colour for the Cerean ices, ranging from a bluish tinge for the recently exposed/erupted sub-surface ices to a more reddish tinge for the older crater ices (6). It's not known why this colour differential is evident, but it seems to imply some kind of process at work on the surface of Ceres. Cryovolcanic activity is the mostly likely theory to explain this effect. The counter-argument that this theory has encountered in the past is that there needs to be an internal source of heat and pressure to drive these volcanic processes, which on the face of it seems unlikely on an isolated planet of the size of Ceres. Water vapour was seen emerging from Ceres back in 2014, and it was thought that this effect might be due either to (a) cryovolcanoes, or to (b) the sublimation of ice to water vapour (in a similar fashion to that of comets) (7). Both possibilities have their merits and problems. It seems as though Ceres has an abundance of water ice (9), much of it lying close to its surface, and some of it wrapped up in this huge natural structure. One of the implications is that in the past liquid water once flowed over the Cerean surface. This seems eerily reminiscent of similar arguments about Mars, whose own atmosphere is too weak to sustain liquid water on the planet's surface. Yet, evidence suggests that water has indeed flowed across the red planet's surface. So, might Mars also have cryovolcanoes, covered in a heavy dusting of regolith? Might similar processes on Mars send plumes of water vapour into its atmosphere, thus falling back as freezing rain, becoming flash-flood channels upon the surface? This may well explain what's seen on Mars. Looking at the bigger picture, the solar system is providing us with evidence of more active geophysical processes than previously thought possible. Below the seemingly dull surfaces of various worlds, there is quite a lot going on. This flies in the face of theory, which previously considered these worlds to be essentially dead lumps of rock. Migration of planets seems a key factor, helping to explain why planets located within the snowline have so much water ice buried beneath the surface (which should have been driven off early in the lifetime of the solar system). This opens up the possibility that the Earth, too, may have migrated from a different location further away from the Sun. Remember - the Earth also has a rather extensive water resource given its current relative proximity to the Sun. Water is also evident on the Moon. Now available abundantly on Ceres. Probably, then, under the surface of most asteroids? Isn't it ironic that comets aren't 'dirty snowballs' as had been predicted for decades, but rocky bodies with internal volatiles? At the same time, asteroids may not be dead rocks after all, but complex, water ice-infused structures which include the remarkable 'ice palace' Ceres. It's all back to front, isn't it? The entire fabric of the solar system is testing the old and tired theory of steady-state ennui. Radical hypotheses are required to explain this about-turn. 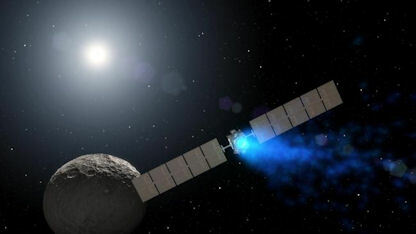 "A joint European Space Agency and Nasa mission will test such technology in the next few years, under the name Asteroid Impact and Deflection Assessment (Aida). 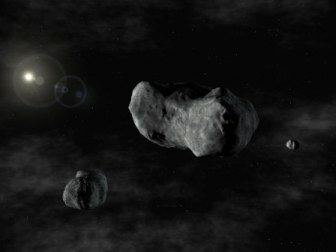 The mission consists of two spacecraft, one called the Asteroid Impact Mission (Aim), which will launch in late 2020, and the second, the Double Asteroid Redirection Test (Dart), in 2021. The problem with such missions -beyond how effective they may actually be in altering the trajectory of the asteroid itself - is the turn-around time for such a mission. Is there enough time between the realisation that there's an in-coming object posing a threat to a localised zone on Earth (or worse) to get a mission off the ground (literally) to deflect it? Perhaps that's why NASA and FEMA are also simulating the need to evacuate a projected impact zone. I suspect that it is quite normal for stars to have dark, massive objects orbiting around them at great distances. Proxima Centauri offers us a great precedent for this, but was only visible to us because it is actually a blazing red dwarf star. The system is about 6 billion years old, quite a bit older than our Sun. Any objects smaller than red dwarfs at this age would be essentially dark - like brown dwarfs, or massive gas giant sub-brown dwarfs. 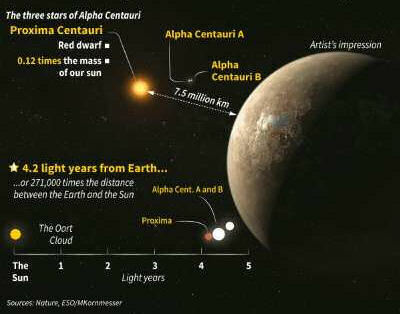 They would not be seen in the same way that Proxima Centauri has been observed. Yet, such dark objects could also be out there, orbiting parent star systems at great distances. I think this scenario is the norm; rather than an isolated, extreme possibility. Know that, esoterically speaking, a prominent star placed between two pillars/trees/etc on a door/opening symbolizes the planet Venus or the 'Morning/Evening Star'... which, as the Morning Star (the herald of the Sun before dawn), is historically known as Light-Bringer or Lucifer. The more occult symbolism is what I'm highlighting; I'm drawing attention to concepts of illumination. 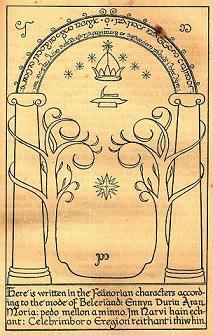 The configuration of a pillar on either side of a door (the pillars being trees in the case of Durin's Doors - both the trees standing on either side of the doors + the trees on the design of the doors), this is representational of the bi-cycles governing our experience here, duality basically (note that '11', two pillars or 'Two Towers', is a symbol of duality). Like Boaz and Jachin of Solomon's Temple, Boaz / the left pillar or pillar of the Sun, Jachin / the right pillar or pillar of the Moon, the opposing forces of the daily 'bi-cycle' (like the popular brand of playing cards), of Day and Night, the opposing forces of the yearly bi-cycle, of Summer and Winter... light and dark, life and death, etc. I can see the wisdom in what you're describing. Our perspectives are slightly different, in that I believe that much of this symbolism arises from very ancient star religions (Egyptian/Mesopotamian) and that there is an archaeo-astronomical element to these symbolic constructions. In other words, the two pillars may originally have been horizon markers to denote a position of a star or planet in the sky, or during heliacal rising. Esoteric symbolism built up from the deities associated with these stars/planets then takes on importance within the later traditions which build upon the old star religions. Alchemy may have been a vehicle transposing one to the other, for instance, as perhaps may Freemasonry (although the idea that Freemasonry was directly derived from ancient times is contentious). 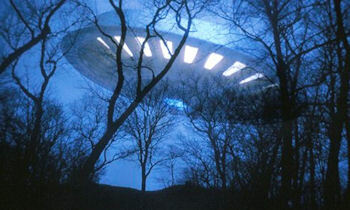 In answer to your question, I'm not sure that kind of quality UFO evidence exists. I've noticed that that the better the video technology available to ordinary people (through mobile phones, tablets etc), the less apparent the UFOs in the mass or social media. This suggests to me that there aren't UFOs in our skies, at least as a readily recordable phenomenon. So, does than mean that all of those grainy and poor-quality photos and videos from the 50's, 60's, 70's, 80's of flying saucers and mysterious lights were hoaxes/misidentified, and so on? It could be. But what then of the many excellent 'unknown cases' scientifically examined by Project Blue Book, Grudge etc, the solutions to which remain mysterious?